Register for individual days or for the entire time. Full-day or half-day (9:30 to 1:30 or 1:30 to 5:30) options available. Trainings will be run by current MKFC coaches, non-MKFC players must try out. 10:00 to 11:30 Technical exercises with focus on individual technique. 5:00 to 5:30 Clean up, relax. Players should wear MKFC practice gear. Printed medical information that the coaches may need (allergies, etc...). 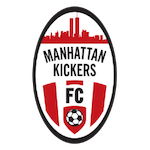 Check out this Soccer camp 'MKFC 2019 Summer Camp at Chelsea Waterside Park' with Manhattan Kickers FC!